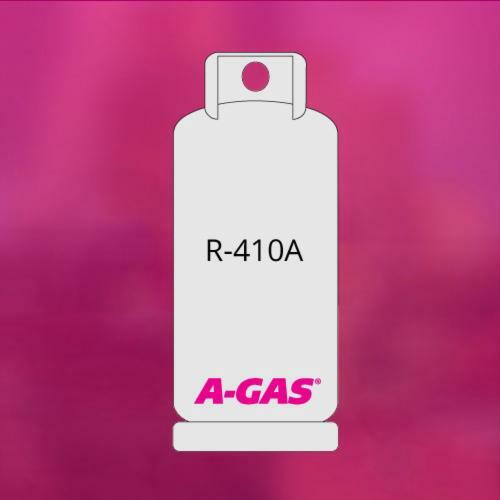 A-Gas®, R-410A Refrigerant, 25 lbs Container, Liqui¿ed Gas, -61 °F Boiling Point, Pentafluoroethane;Difluoromethane, HFC Refrigerant, Cylinder Container, Pink, Slight Ether-Like Odor/Scent, +158.3 °F Critical Temperature, 67.74 lb.ft³ Density A blend of R-32 and R-125 that nearly forms an azeotrope, which means it has extremely low temperature glide and almost no fractionation potential. This blend has about 60% higher pressure than R-22 in air conditioning applications, and therefore should be used only in new equipment specifically designed to handle the pressure. Systems designed for R-410A will have smaller components (heat exchangers, compressor, etc.) to perform the same cooling job compared to R-22. R-410A will require POE lubricants. Retrofitting R-22 equipment is not recommended under any circumstances.